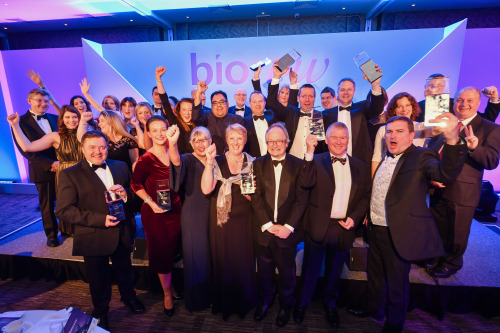 More than 300 people attended the awards dinner in Cheshire, which saw medical technology companies, Blueberry Therapeutics, 4X Discovery, Zilico and LightOx all win prizes for the application of their cutting edge technologies to the life sciences sector. Alby Pattison, founder of North East company Hart Biologics received the coveted Outstanding Contribution Award. Alderley Park based Blueberry Therapeutics received the sought-after Company of the Year award and is applying nanotechnology to the delivery of medicines for difficult-to-treat skin and nail infections. Blueberry has had a remarkable year, including its BB2603 Phase I/II trial of 46 patients trial successfully meeting its primary endpoint in patients with both onychomycosis (fungal nail infection) and concomitant tinea pedis (athletes foot), as well as completing its £10m series B Fundraising.